Studio Fee: Applies to each person painting, and covers all the painting, glazing and firing. The studio fee is per sitting, not per piece. Keep your eyes out for special days with reduced studio fees! Pieces: Our bisque pieces range in price and begin as low as $3.50 plus tax. Are ALWAYS Two-For-Tuesdays! Two people paint for one studio fee. Are ALWAYS Family Day! 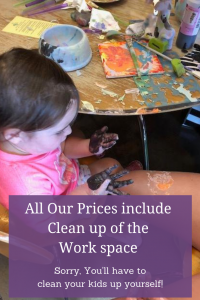 Pay reduced studio fees when the entire family paints. After you are done painting your completed piece, you leave it with us. We will then glaze and fire them, and you get them back in one week! All paints are non-toxic, and all finished pieces are food safe!